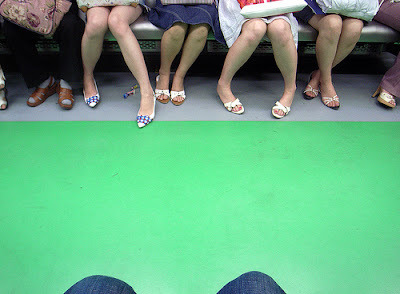 Have a lovely long holiday weekend -- and don't forget to work those white shoes while you still can! 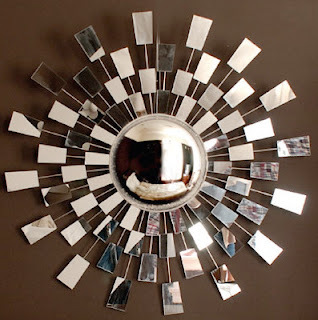 Sunburst mirrors are showing up all over the place lately. (Are they part of Becky's "Trendy Objects Drinking Game" over on Hatch? If not, they should be.) 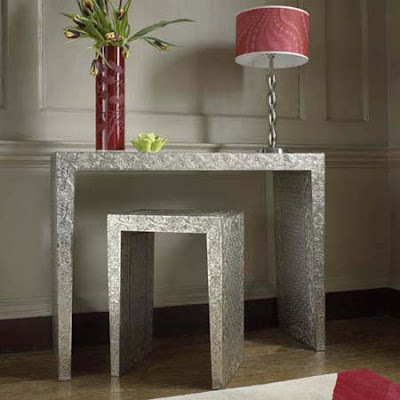 And for good reason -- they add instant drama, a touch of sophisticated swank, and undeniable fabulousness to your space. 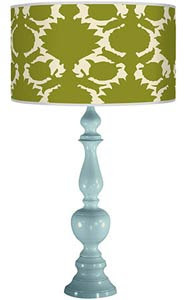 But like many pieces of popular decor, there are literally dozens of variations available at a startling array of price points: everything from relatively small and spare versions that you can find at your local mall store to substantial, pristine antiques that will set you back several thousand dollars. 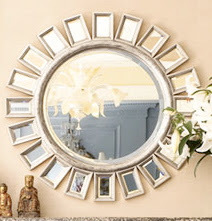 West Elm Convex Star Mirror, $49: This is definitely affordable and has a clean, modern sensibility -- but it seems a bit small (it's not quite two feet across), spindly, and sad compared to the others here. 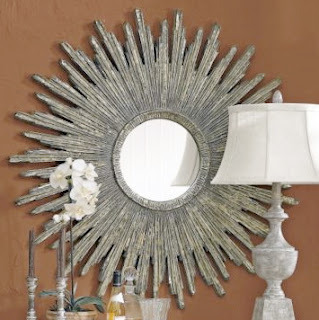 Solare Mirror from Ballard Designs, $119: A nice size (three feet in diameter) at a great price. 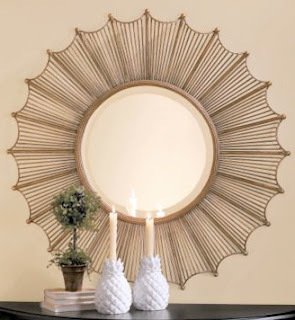 Z Gallerie Prague Mirror, $139: A simplified contemporary take on the sunburst shape, this is well-priced and has presence -- but also strikes me as a bit generic. 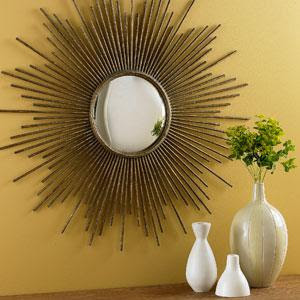 Starburst Mirror from Crate & Barrel, $199: This 30-inch model alludes to the metal wall sculptures that were popular in the Sixties and Seventies, and I like the combo of brass and steel. 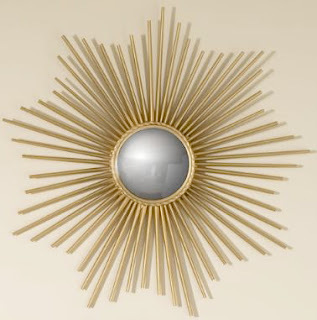 Cyrus Mirror from Horchow, $220: Another contemporary variation on the classic sunburst shape; it's a bit too childlike for my taste, though -- something about it makes me want to draw a happy face in the middle, like a child's sketch of the sun. 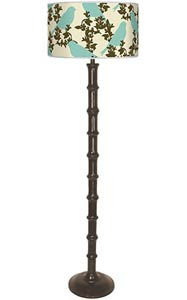 Linen Source Sunburst Mirror, $229: Great size (it's more than three feet in diameter) with a glam style that nods to the vintage versions; the mottled faux finish worries me a bit, though. 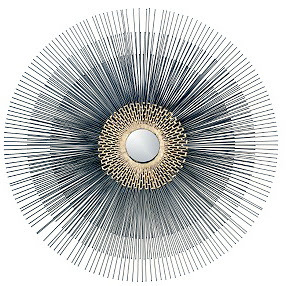 Vega Mirror from Ballard Designs, $229: In my opinion, this is the modern sunburst that comes closest to emulating the gilded antique models; plus, at nearly four feet in diameter, it's a good deal for the size. 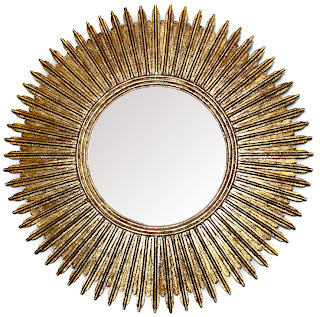 Gold Sunburst Mirror from eBay Store Highgatehome, $234: Compare this to the strikingly similar (but much more expensive) mirror from Biggs Powell, below; personally, though, I'm not quite ready for the return of gold decor. 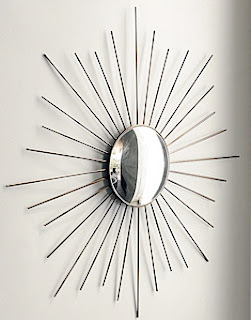 Kenneth Wingard Sunburst Mirror from CSN Lighting, $349: Aside from West Elm's, this sparkling model is probably the best fit for a really modern room; I like how it mimics the form of midcentury teak sunburst clocks, too. 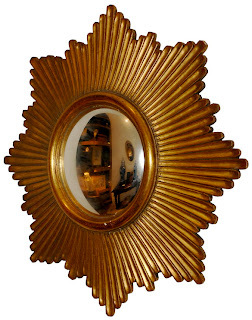 Howard Elliot Rio de Janeiro Mirror, $420: The shape of this mirror is a close match for the vintage originals, but that bright bronze finish kind of scares me (there is, after all, a very fine line between fabulous and tacky). 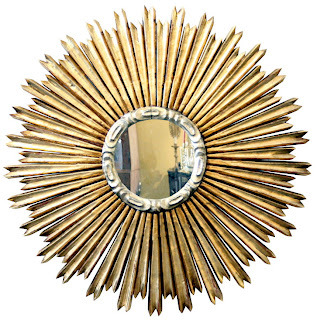 French 1950s Brass Convex Sunburst Mirror from Biggs Powell, $1,300: Wonderful form and sterling provenance, but the cheapskate in me would probably opt instead for the Highgatehome knock-off, above, for about a fifth the price. 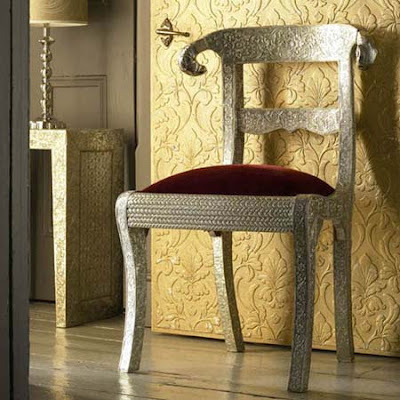 Circa-1930 French Gilded Mirror from Lebreton-Laurence, $2,700: Super-swanky, to be sure -- but ouch, that price; at 26 inches, it's a little on the small side, too. 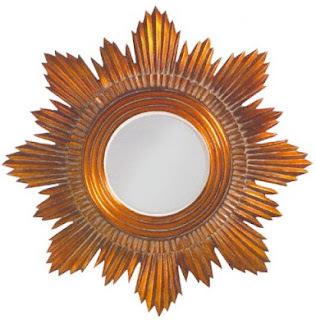 French 1940s Gilded Sunburst Mirror from Barley Twist, $2,800: You can't get more glam than Forties French decor, and I love how the sun's rays alternate between long and short; still, that price is more than I bring home in a month. 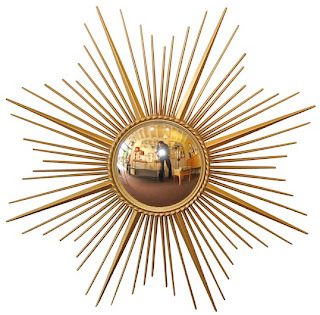 Circa-1970 Mexican Sunburst Mirror from Douglas Rosin, $8,000: Yowza -- if I ever win the lottery, this five-foot-plus baby is all mine. 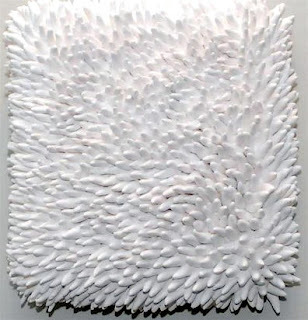 I love the simplicity and the texture of these ceramic wall tiles from Asheville, North Carolina ceramist Heather Knight. Each handmade tile measures 10 inches square, and has a keyhole on the back for easy hanging. 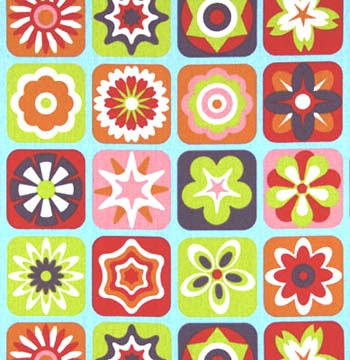 As the seller suggests, these would look amazing on a brightly painted wall or even against a box or stripe painted on the wall. 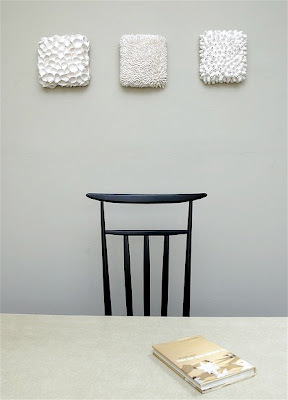 The tiles come in oyster, reef, and barnacle textures and are available for $120 each from the Element Clay Studio Etsy Shop. 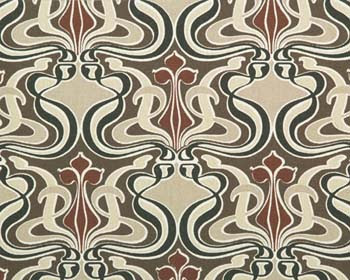 Speaking of fabric art and Tonic Living, I was just perusing the Toronto-based fabric site's new offerings, and found a lot to love. 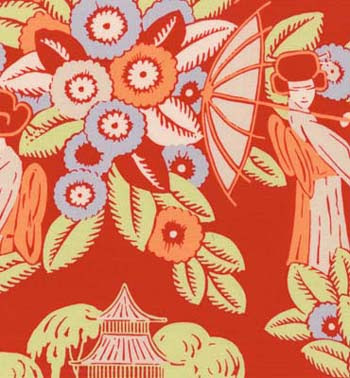 With textile designs from the likes of Alexander Henry, Michael Miller, and Robert Kaufman, Tonic Living's selection is unabashedly colorful, graphic, and fun. 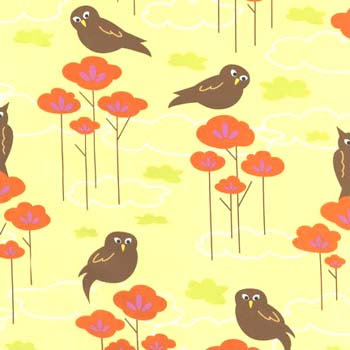 And I really appreciate the complementary fabric suggestions that pop up along with each fabric closeup -- it makes mixing and matching colors and patterns that much easier. 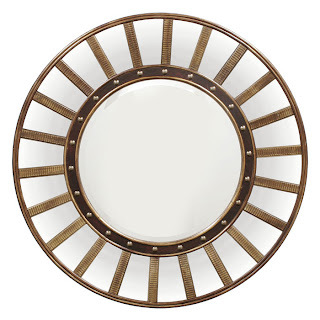 London's Graham & Green always has the best stuff. 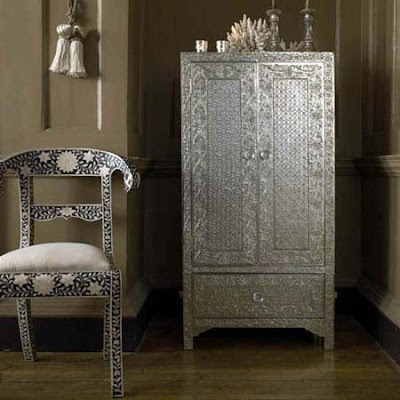 But let me back up: Kate over at Girl Meets Glamour was debating dining chairs yesterday, and I clicked through to the G&G site to get a closer look at one of her contenders, an embossed white metal ram's head chair from India (above, 195 pounds -- about $390). 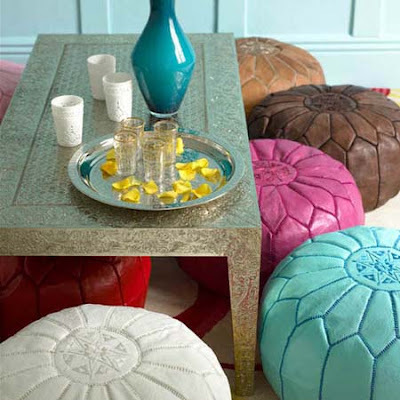 Lo and behold, Graham & Green has an entire collection of these beautiful embossed pieces, which somehow manage to meld lush exoticism with refined glamour. True confession: Art intimidates me. 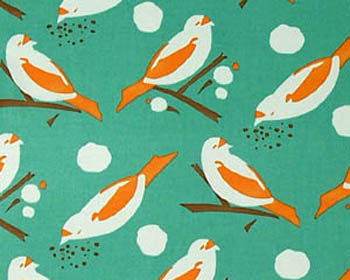 I'm well over the sort of mass-produced prints (Man Ray, anyone?) 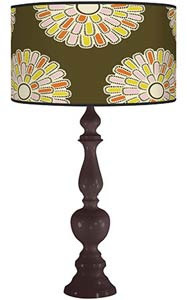 that decorated my post-collegiate homes. And yet I haven't quite graduated to buying much "real" art -- for one, a lot of it is simply out of our budget. But even when it comes to buying smaller pieces from emerging artists, I don't quite trust my eye yet. So for now, I'm making due with framed prints from various artists that I've discovered via Etsy and at a few local galleries and exhibition spaces. Well, that, and hanging fabric. 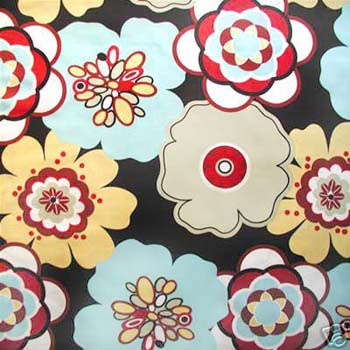 I started with the retro-inspired fabric above, which I bought from the awesome Tonic Living a couple of years ago. 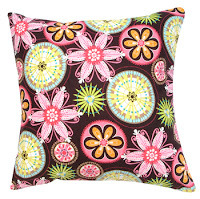 I knew I wanted to do some sort of project with it -- at first I was thinking pillows, until my lack of sewing skills and even a sewing machine put the kibosh on that idea. Then I decided to simply buy some cheap art-store canvases, stretch the fabric around them, and affix it with a staple gun. 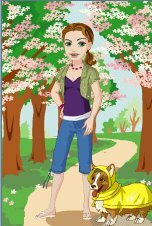 Voila -- instant "art." I picked up this Inhabit stretched canvas at the last Design Public warehouse sale, and hung it in our downstairs hallway. Another Inhabit stretched canvas snagged at the Design Public warehouse sale. 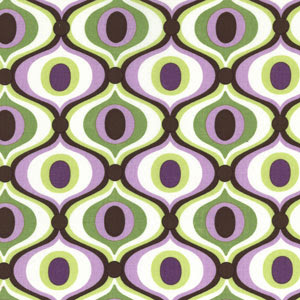 I freakin' love this huge Marimekko print (I bought one of Textile Arts' handy frame kits for it, since a canvas this size would've been prohibitively expensive and heavy). 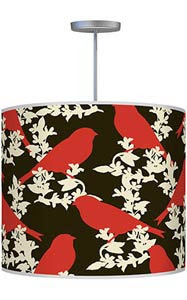 I haven't hung it yet because I think we're going to repaint the dining room -- I love the red, but it's just not working with the colors I'm drawn to these days. 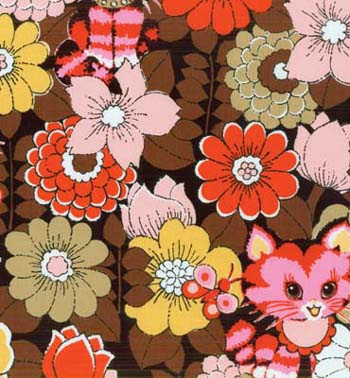 This is some groovy vintage fabric I found on eBay Australia. 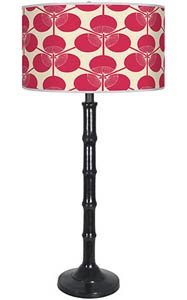 It's destined for the unfortunate pink bathroom. 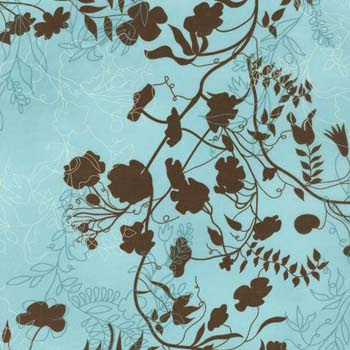 More of that stretched Tonic Living fabric, which currently resides in my mad-for-blue daughter's room. 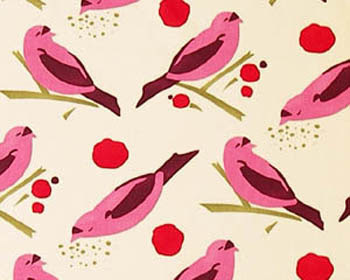 Have any fabric art projects of your own you'd like to share -- or other surprising ideas for using fabric or non-traditional items as art around your home? Send them in! 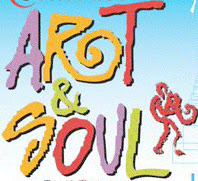 If you live in the Bay Area and are around over the coming Labor Day Weekend, be sure to stop by the Oakland Art & Soul Festival, which runs Saturday through Monday, September 1-3. 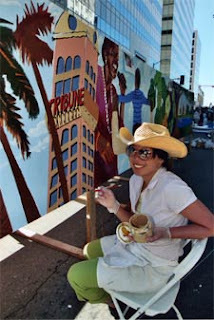 Art offerings will include local artisans selling their wares; participatory art in the form of community mural painting, a sculpture installation, and a progressive table sketching project; exhibitions and demonstrations by local artists Tim Armstrong, Jessica Cadkin, and Chelsea Pegram; and kids' arts and crafts organized by the Museum of Children's Art and the East Bay Depot for Creative Reuse. My latest opus for HGTV.com: "Transform bland bookcases and wall shelves into stunning displays with 13 top-shelf decorating tips from interior designers." And don't miss all the great shots of viewers' beautifully accessorized shelves pulled from the new HGTV Decorating flickr pool. 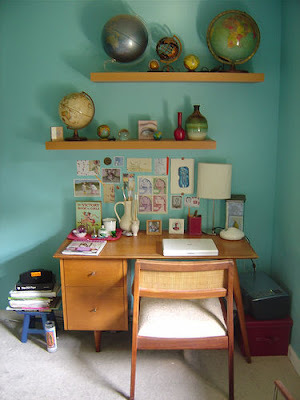 There's lots of wonderful, real-life inspiration to be found there. 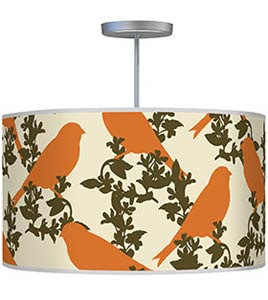 I LOVE LOVE LOVE the brand-new Thomas Paul lighting collection at 2Modern -- why did it take him so long? 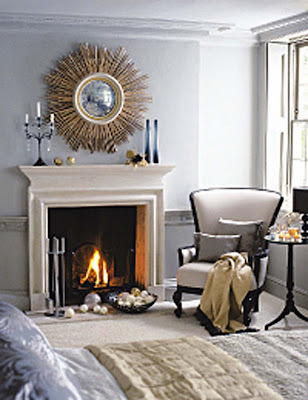 See the entire Thomas Paul collection here.